A fire broke out in a six story apartment building last week in a near by town. A blonde, a redhead, and a brunette escaped the flames by climbing up onto the roof. When the fire department arrived they got out a blanket held it up and the Chief called out to the brunette to jump into the blanket. As she was falling 'swoosh' the firefighters pulled the blanket away and she landed on the street like a brick. 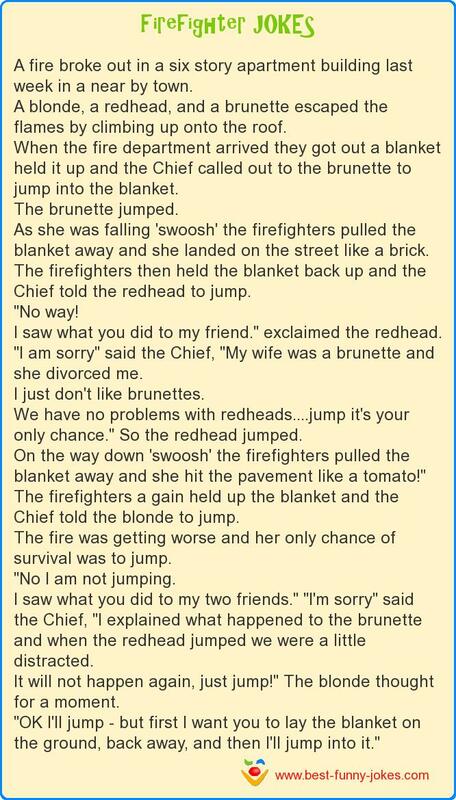 The firefighters then held the blanket back up and the Chief told the redhead to jump. I saw what you did to my friend." exclaimed the redhead. "I am sorry" said the Chief, "My wife was a brunette and she divorced me. I just don't like brunettes. We have no problems with redheads....jump it's your only chance." So the redhead jumped. On the way down 'swoosh' the firefighters pulled the blanket away and she hit the pavement like a tomato!" The firefighters a gain held up the blanket and the Chief told the blonde to jump. The fire was getting worse and her only chance of survival was to jump. "No I am not jumping. I saw what you did to my two friends." "I'm sorry" said the Chief, "I explained what happened to the brunette and when the redhead jumped we were a little distracted. It will not happen again, just jump!" The blonde thought for a moment. "OK I'll jump - but first I want you to lay the blanket on the ground, back away, and then I'll jump into it."